Does your cat contentedly use his scratching post on the main floor of your home but your bedposts endure the scratching upstairs? Is one room of your home safe from the assault of feline nails but another seems to be constantly at risk? Why does your cat scratch your belongings in some areas of your home but not others? There are a few reasons that your cat might scratch your belongings in certain areas of your home while leaving others alone. Something specific might be causing your cat stress in the scratched area. For instance, if your cat is scratching at the frame of a particular door or window, there may be an outdoor cat that likes to hang out just outside that section of your house. Another possibility is that one cat is chased or picked on by another cat in your home, and the meeker cat may scratch in an area that he feels comfortable in order to release some of the stress. You can learn more about stress scratching and find specific tips for dealing with it in the article "Is Your Cat a Stress Scratcher?" The primary reason that cats use scratchers in one area of the home but scratch at belongings in another area is that there aren't scratchers present in all of the areas where they want to scratch. For the most part, cats won't travel far in search of a scratching post that is acceptable to their human when they feel the need to scratch. So, if there is a great scratching post nearby when he wants to scratch, your cat will be likely to use it, but if it is down two flights of stairs, he isn't likely to make the trip. This can result in certain areas of your home being damaged by scratching. Near sleeping areas. Cats often want to stretch and scratch when they first wake up. Placing scratchers near your cat's favorite sleeping areas is a great idea. This may include your own bedroom if your cat likes to sleep with you. Near eating spots. Many cats also like to have a scratch after they eat. 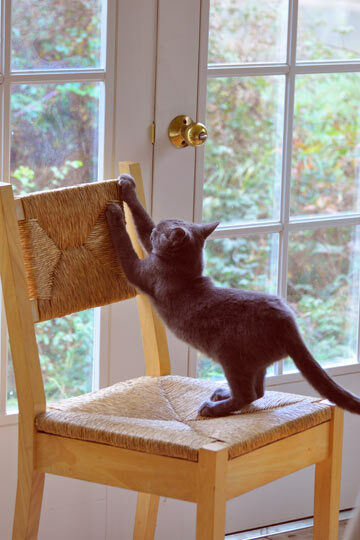 Making sure that you have an appropriate scratcher near your cat's food bowl can save your furniture. On every level. Each level of your home should have at least one scratching post. If your house is large or you have multiple cats, you should consider having more than one on each level. That way, when your cat wants to scratch, and he's upstairs, he won't have to trek downstairs and across the house in search of a scratching post. In unexpected spots. Cats love to "discover" scratchers in hidden areas where they aren't necessarily expecting to find them but where they often like to have a scratch. Examples are under the humans' beds and in the corners of closets. The corrugated cardboard insert of an angle scratcher is a great idea for hiding in these spots so your cat can find it and have a nice scratch. In high-traffic areas. One of the reasons cats scratch is to mark territory. This means that highly visible areas in your home are prime spots for placing cat scratching posts. If you don't, the furniture in those areas will be at risk. These areas are especially important ones for placing posts when you are first training your cat or kitten to use them. After that, you may be able to move them, an inch or two a week, to a less obtrusive spot like a corner of the room. However, you'll need to watch your cat carefully to ensure that he doesn't lose interest in the post as you move it to a less-trafficked spot. It's best to have a scratching post in every area of your home and every level that your cat can access. For discounts on multiple posts, check out the bundles and deals at PurrfectPost.com. Having enough cat scratching posts for the size of your home and number of cats you have and choosing the best spots for them can significantly decrease any damage that may be occurring to your belongings or home as a result of your cat's claws. It's equally essential that the posts you place in these important areas have the qualities that are important to your cat in a scratcher. 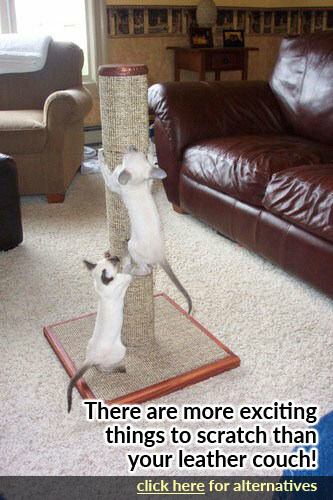 You can learn more about these in the article "How to Choose the Best Cat Scratching Post."